I apologize for all the recipe posts, as it seems that’s all I’ve done for the last week! I do have have some great craft to post on soon and I also have a big announcement coming in the next couple of days so I promise it will be worth the wait! It was cold and rainy here all day yesterday so my husband wanted me to make a chili for dinner. 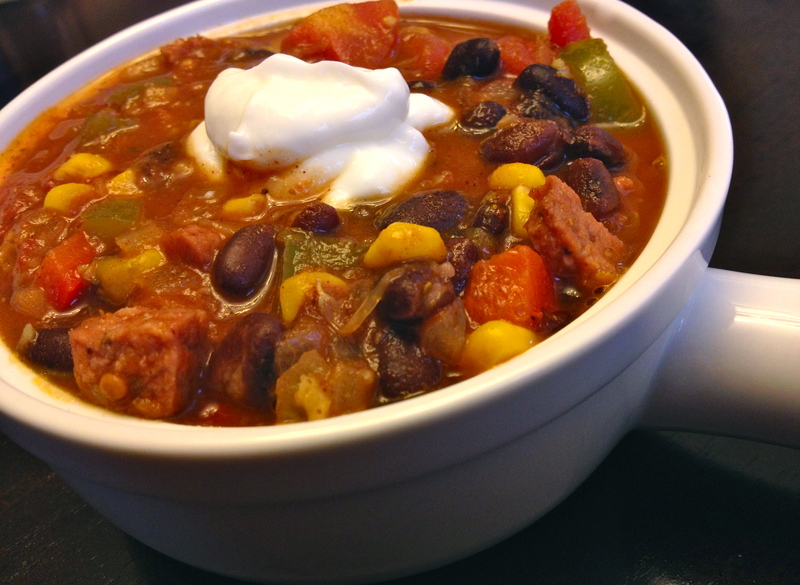 This ones great because it has all the great Mexican flavors that make a soup delicious, but it also has the added heat from chorizo sausage and some chocolate added in the end that give this chili a rich note that ties it all together! This makes about 12 cups of chili so you’ll have plenty of leftovers, but you can easily cut the recipe in half to make a smaller batch! Start by heating 1 tbsp extra virgin olive oil in a dutch oven over medium high heat. Add 2 1/2 cups diced onion, 1 diced red bell pepper, 1 diced green bell pepper, 5 cloves minced garlic and 2 diced links of chorizo sausage. Cook until softened, stirring often, for about 5 minutes. 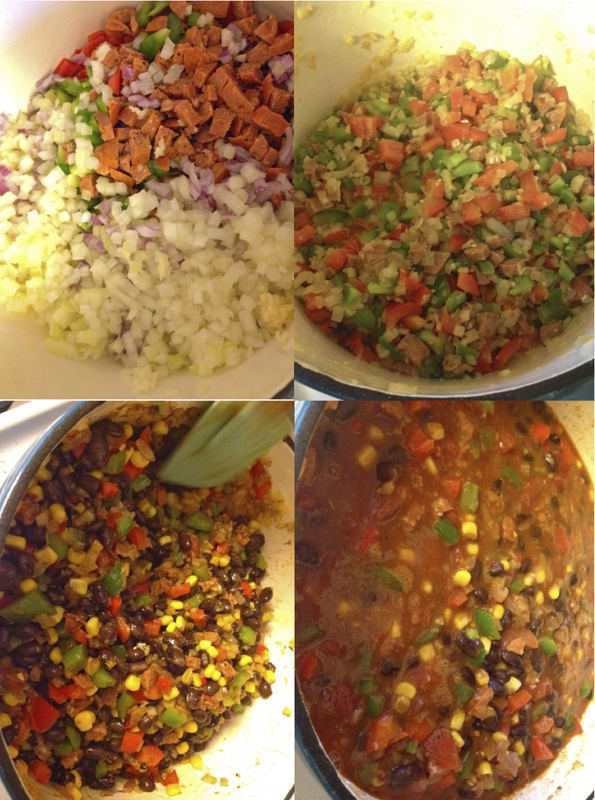 Stir in 1 1/2 tbsp chili powder, 1 tbsp ground cumin, 1 1/2 tsp dried oregeno, 1 tbsp fresh squeezed lime juice, 1/4 tsp ground cinnamon, 3 (15.5 oz) cans of drained and rinsed balck beans and a can of drained and rinsed no-salt added corn. Stir well and then add in 2 (28 oz) cans of crushed tomatoes with their juice. Turn up heat and bring to a boil. Reduce heat to a simmer, cover and cook for 30 minutes stirring occasionally. Stir in 1 tsp salt, 1/2 tsp black pepper and 2 oz chopped semi sweet chocolate. Serve in bowls with a dollop of sour cream and enjoy! If you like this recipe, check out the posts for my other chili recipes: BBQ Beef Chili and Sparky’s Quick and Easy Chili or check out my post on Mexican Tortilla Soup!